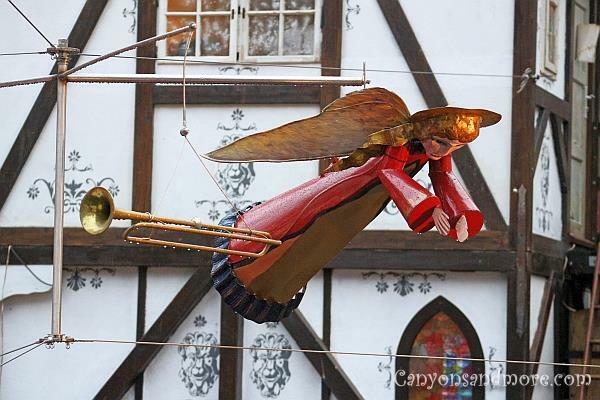 Dresden is so festively decorated during the weeks of the Advent. 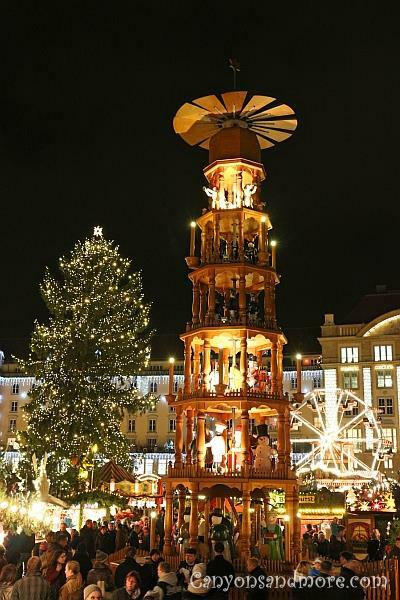 There are at least 10 different Christmas markets you can visit while visiting the city and each one is unique in its own way. 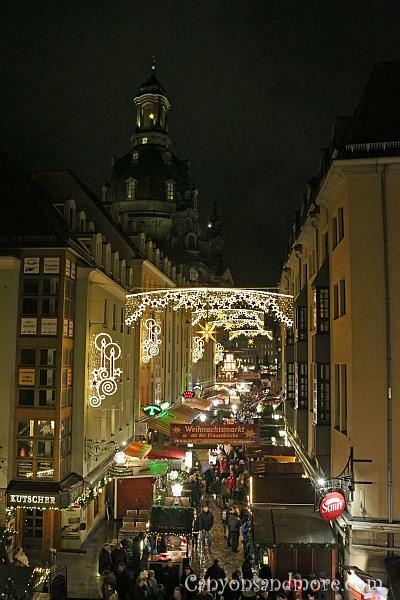 Three of these markets are featured here: the “Weihnachtsmarkt an der Frauenkirche and the “Mittelalter-Weihnacht” and the famous “Dresdner Striezelmarkt”. Find even more information at the Dresden Stiezelmarkt at the Dresden.de website. The information is written in English.Here you can read more information and see more images about the Dresdner Striezelmarkt. 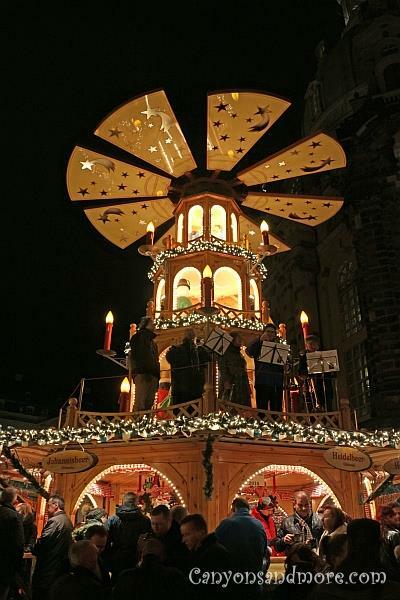 The image above shows the “Weihnachtsmarkt an der Frauenkirche”. Christmas music fills the air and it is an enjoyable place to go to meet up with friends, do a little Christmas shopping and drink some mulled wine to warm up. 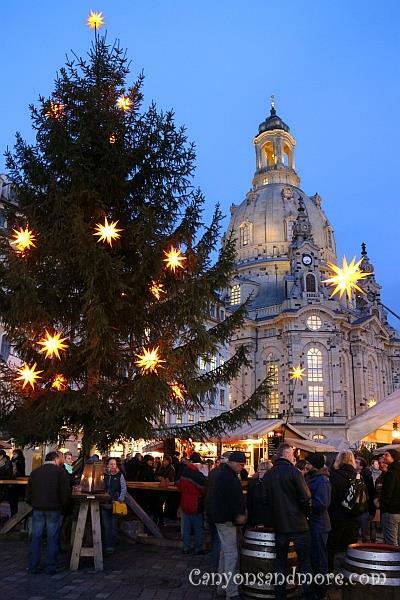 When the bells of the Frauenkirche ring, it is blissful to hear them echo over the Christmas market. There is a possibility to see the market from above. At this location, steps lead up and from here you can see the market with the “Frauenkirche” overlooking it. Behind you is the Elbe River and you can walk along the “Terrassenufer” promenade or waterfront to several of Dresdens famous structures such as the “Residenzschloss”, the “Semperoper” and the “Kunsthalle”. At this point when you are facing the Elbe River and if you proceed to the right, you can walk until you the reach the next bridge. If you walk onto the bridge until the middle of it, you can get beautiful photos of the skyline of Dresden. Especially during the Christmas season, the city seems to be wonderfully illuminated. 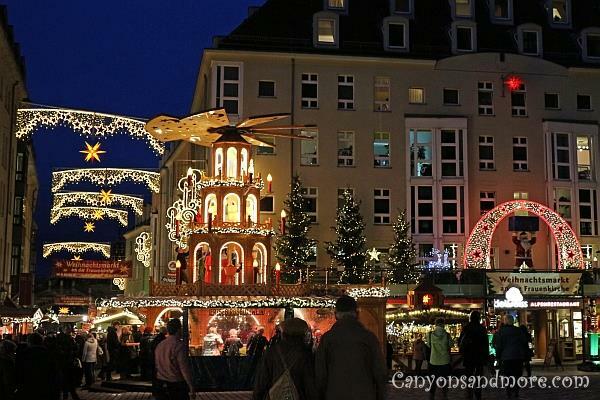 This is a Christmas market pyramid with “Erzgebirge” (Erz Mountains) figures located in front of the “Frauenkirche”. The pyramids are a great meeting point and usually drinks can be bought at them. 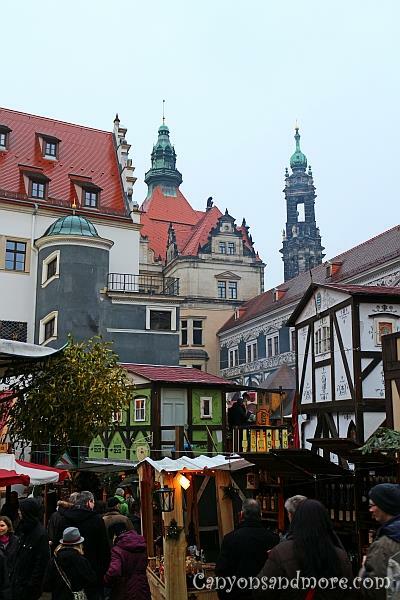 The “Frauenkirche” looks beautiful in the background of this market. One evening, a handful of local musicians stood on the first level of the pyramid and played typical German Christmas carols. Their songs added an even more festive feeling to the market. 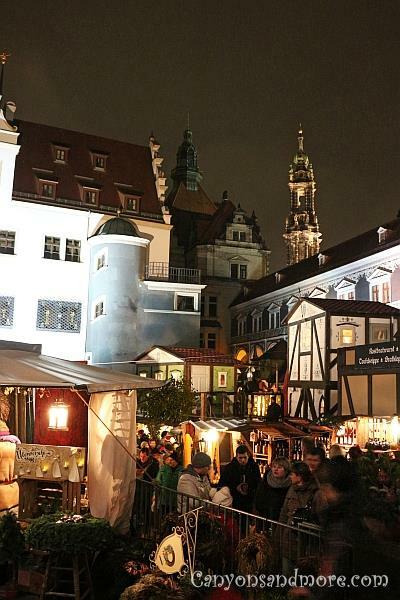 The most famous Christmas market at Dresden and the oldest in Germany is the Dresdner Striezelmarkt. 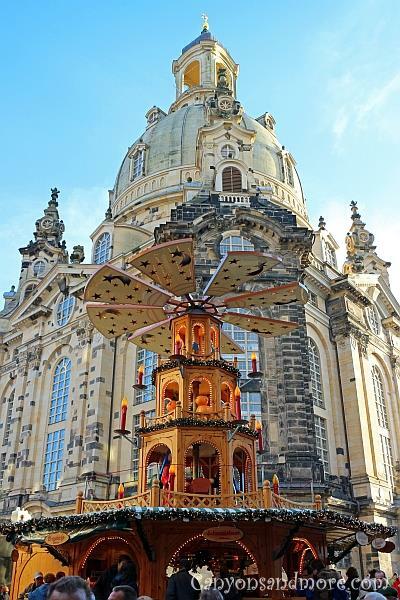 This market dates back to the year 1434 and is in the heart of Dresden not far from the Residenzschloss, the Zwinger Semperoper and Frauenkirche. 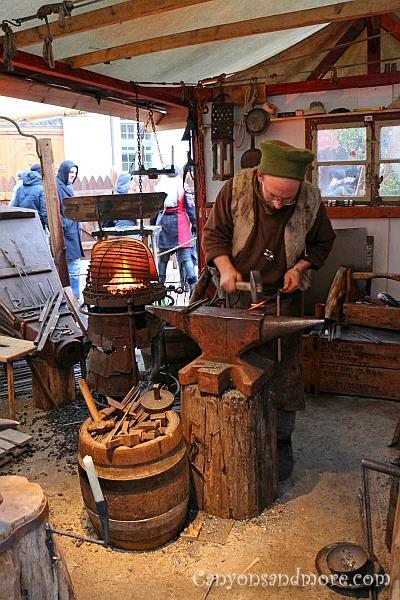 A blacksmith was demonstrating his skills. At night the festivities continue. This lovely angel was hovering over the market.